Is Jupiter's Great Red Spot a Sunburn? Nov 28, 2014: The ruddy color of Jupiter's Great Red Spot is likely a product of simple chemicals being broken apart by sunlight in the planet's upper atmosphere, according to a new analysis of data from NASA's Cassini mission. The results contradict the other leading theory for the origin of the spot's striking color -- that the reddish chemicals come from beneath Jupiter's clouds. The results were presented earlier this month by Kevin Baines, a Cassini team scientist based at NASA's Jet Propulsion Laboratory, Pasadena, California, at the American Astronomical Society's Division for Planetary Science Meeting in Tucson, Arizona. Baines and JPL colleagues Bob Carlson and Tom Momary arrived at their conclusions using a combination of data from Cassini's December 2000 Jupiter flyby and laboratory experiments. In the lab, the researchers blasted ammonia and acetylene gases -- chemicals known to exist on Jupiter -- with ultraviolet light, to simulate the sun's effects on these materials at the extreme heights of clouds in the Great Red Spot. This produced a reddish material, which the team compared to the Great Red Spot as observed by Cassini's Visible and Infrared Mapping Spectrometer (VIMS). They found that the light-scattering properties of their red concoction nicely matched a model of the Great Red Spot in which the red-colored material is confined to the uppermost reaches of the giant cyclone-like feature. "Our models suggest most of the Great Red Spot is actually pretty bland in color, beneath the upper cloud layer of reddish material," said Baines. "Under the reddish 'sunburn' the clouds are probably whitish or grayish." A coloring agent confined to the top of the clouds would be inconsistent with the competing theory, which posits that the spot's red color is due to upwelling chemicals formed deep beneath the visible cloud layers, he said. If red material were being transported from below, it should be present at other altitudes as well, which would make the red spot redder still. Jupiter is composed almost entirely of hydrogen and helium, with just a sprinkling of other elements. Scientists are interested in understanding what combinations of elements are responsible for the hues seen in Jupiter's clouds, as this would provide insights into the giant planet's make-up. 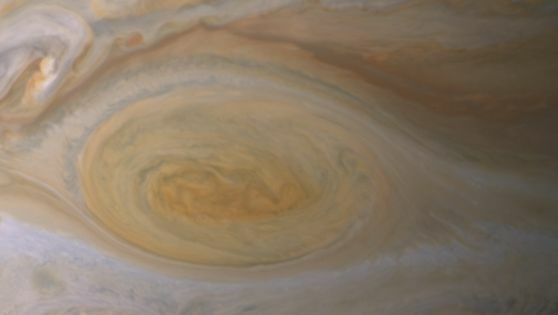 Baines and colleagues initially set out to determine if the Great Red Spot's color might derive from sun-induced breakdown of a more complex molecule, ammonium hydrosulfide, which makes up one of Jupiter's main cloud layers. They quickly found that instead of a red color, the products their experiment produced were a brilliant shade of green. This surprising negative result prompted the researchers to try simple combinations of ammonia with hydrocarbons that are common at Jupiter's high altitudes. Breaking down ammonia and acetylene with ultraviolet light turned out to best fit the data collected by Cassini. The Great Red Spot is a long-lived feature in Jupiter's atmosphere that is as wide as two earths. Jupiter possesses three main cloud layers, which occupy specific altitudes in its skies; from highest to lowest they are: ammonia, ammonium hydrosulfide and water clouds. As for why the intense red color is seen only in the Great Red Spot and a few much smaller spots on the planet, the researchers think altitude plays a key role. "The Great Red Spot is extremely tall," Baines said. "It reaches much higher altitudes than clouds elsewhere on Jupiter." The team thinks the spot's great heights both enable and enhance the reddening. Its winds transport ammonia ice particles higher into the atmosphere than usual, where they are exposed to much more of the sun's ultraviolet light. In addition, the vortex nature of the spot confines particles, preventing them from escaping. This causes the redness of the spot's cloud tops to increase beyond what might otherwise be expected.Other areas of Jupiter display a mixed palette of oranges, browns and even shades of red. Baines says these are places where high, bright clouds are known to be much thinner, allowing views to depths in the atmosphere where more colorful substances exist. The Cassini-Huygens mission is a cooperative project of NASA, the European Space Agency and the Italian Space Agency. JPL, a division of the California Institute of Technology, Pasadena, manages the mission for NASA's Science Mission Directorate in Washington. The VIMS team is based at the University of Arizona in Tucson.